It always amazes me, after having spent two to four hours with a first-time client and thinking we’re on the same page, to discover some weeks later that they’re still counting calories, measuring portions, and skimping on dietary fats. The myth that such practices engender good health and a slender figure is so deeply engrained in our culture, I’m not sure what it will take to dispel the brainwashing. All we need to do is look around to see this doesn’t work. Evidently what we see on TV is more convincing than our daily experience. This morning’s breakfast inspired me to write about the unfortunate ‘fat lies’ which have saddled this nation for over six decades. I’m not going to spend a lot of time documenting the flawed scientific studies designed to usher in an entirely new market in foods — ‘salad’ oils. Fear tactics serving industry. For those of you unfamiliar with the history, prior to World War II, Americans used a small handful of cooking oils proven to serve humans for centuries: animal fats, coconut oil, olive oil. We did not have aisles of GMO, corn, canola, and God-knows-what salad oils filling our grocery stores. Neither did we have an obese population. But let’s cut to the chase and get to breakfast. The photograph above is a shot of Sue’s entire breakfast with half of her roasted red pepper and garlic chicken sausage. She’s gotten in the habit of eating only half of this delicious morsel, and saving the other half for perhaps later in the day (the half is what’s pictured — she’s already eaten half). 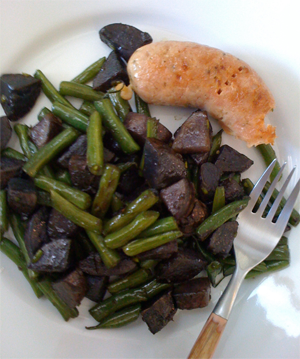 A gorgeous batch of fresh green beans and three small purple potatoes comprised the remainder of the meal. Ordinarily I steam the potatoes a bit before sautéing, but today I just threw them in the wok and started stir-frying. I started with a big dollop of butter. When the green beans went in, I added some olive oil — organic, of course. The cooking took longer than usual with this approach, so in addition to continual stirring, I added a ‘cube’ of duck fat (from our Thanksgiving duck, frozen into ‘duck cubes’ and sealed to preserve flavor — handy little items to have around for simultaneously adding delicious flavor with needed liquid). The wok’s contents were seasoned with nothing more than Celtic sea salt. Sound like a lot of fat? Do we have a weight problem? Are we worrying about high blood sugar? Are we fretting over cholesterol? Do we think about calories? Do we measure our ingredients? Dream on. We don’t even own a body weight scale. Such a breakfast (a moderate amount of fish or animal protein, lots of vegetables, and some cooked whole grains, with a comfortable amount of healthy fat) is delicious, immensely satisfying (fat does that, you know), and it holds us until around 1PM. No blood sugar drop, nice steady energy all morning. Repeat this type of meal at lunch, and ‘dinner’ usually amounts to an apple or some nuts, or maybe some broth. I hate to say it, because it really shouldn’t be this way, but I believe there is so much distorted information out there, old and new, that professional guidance is required to acquire a truly high level of health. But that’s a huge discussion, beyond the scope of this post. My suggestion for a good start? Fix a luxurious breakfast that sets the tone for the entire day. Buy good, fresh, organic raw ingredients (nothing in a bag, box, can, bottle, or bag). Take the modest amount of time it takes to prepare them with love and imagination, and enjoy your self! I had a flash in the shower yesterday… I saw that, yes, this information is immensely valuable to people, and yes, I think what’s required is a school to teach such things. The paradigm is so huge — and utterly alien to Westerners. Are enough people ready for that? I’m doubtful at the moment. But while I contemplate the possibility, I’ll keep blogging — it seems to be valuable to some. And that’s enough. Sure looking forward to San Diego — seems as if it’s been six months! See you there. Three cheers for coconut oil and hemp oil and olive oil! And duck fat.